Would you decide who manages your retirement account by closing your eyes and pointing? Probably not. Yet, Austin City Council is moving forward with a rash plan to hand over the bulk of its power to govern and oversee Austin Energy to an appointed board. A well thought-out Austin American-Statesman editorial reveals the fool-hardness of making such a substantial governance change without even studying if it is needed or if the proposed change would yield better results than the current system of governance by the City Council. This is one of those times when we need to remember that “the only thing we have to fear is fear itself.” City Council (and a couple of our state legislators) have been reacting out of fear that Austin Energy, or parts of it, could be deregulated. But, in light of the recent settlement reached with the out-of-town ratepayers, that is unlikely to happen. We need City Council to stare their fear in the face and make a rational, fact-based decision. Panicking now could cost our utility and our city for years to come. Our city’s most valuable asset should be accountable to us, the citizens of Austin and the customers it serves. Elections don’t always turn out the way I wish and some appointees do their jobs well, but I’m a populist, so at the end of the day, I want the power in the hands of the people. With elections, we give power to individuals to do jobs an with elections we can take that power away. An appointed board wouldn’t have to be responsive to citizen concerns and could make the vast majority of decisions about how Austin Energy is run and what to prioritize. If, after studying the pros and cons of governance by City Council vs. governance by a board, City Council still believes that they are not the best people to oversee Austin Energy, an elected board would be a better option than an appointed board. Let’s keep the power in our hands. Tell Austin City Council not to approve an appointed board. While the proposed resolution to give Austin Energy governance responsibilities to an appointed board has been taken off the “consent agenda”, it’s still alive and kicking. City Council will take up the issue at 6 p.m. this evening (Thurs, 2/14) and I hope you can take a bit of time before dinner to stand up for your rights. 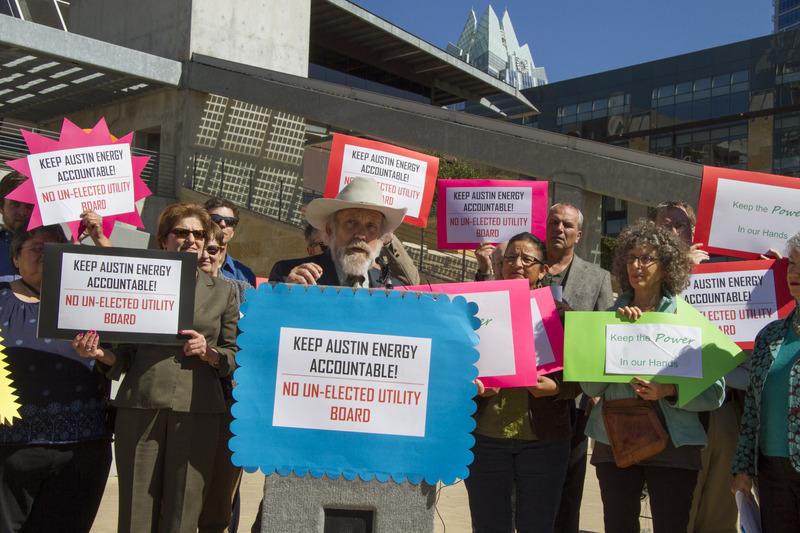 Austin Energy is a owned by us, the citizens of Austin. Currently, we can influence the direction the utility takes by showing up at City Council meetings (just as I’m hoping you will tonight) and voicing your opinions. The people of Austin have spoken passionately and convincingly on a variety of issues including development of strong solar energy programs, assistance for the poor and keeping rates affordable for everyone. City Council has often changed it’s course as a result of public outcry. They do so because they know that they can be held accountable at the ballot box (or the electronic voting machine, as the case may be). An appointed board could dramatically limit the ability that each of us has to ensure that Austin Energy is governed in a way that aligns with our values. Some have argued that a board could focus more on the important issues at Austin Energy, but an appointed board is not the only option. With City Council soon to be enlarged – when we move to the 10-1 system with geographic representation – there could easily be a subcommittee that focuses on the governance and oversight of Austin Energy. If some members of City Council don’t wish to be burdened with the responsibility of governing our most (monetarily) valuable asset, then they could decline to serve on such a subcommittee. Some Austin Energy customers who live outside Austin have complained that they have no representation in the governing body of Austin Energy (which is Austin City Council). That’s a fair point and could easily be remedied by reserving one seat (or whatever is proportional based on population) on the subcommittee for an elected representative of those customers residing outside city limits. What doesn’t make sense it to disenfranchise everyone just because some people aren’t currently represented. Yes, the system could be more perfect and we at Public Citizen are always working toward making it so, but with all the awards and national recognition that Austin Energy has received, we must be doing something right. So, please, make your voice heard at City Hall tonight. The proposed resolution is “Item #46” and will be taken up at 6 p.m. You can register to speak or register your opposition at the kiosks in the City Hall lobby. You can donate your speaking time to someone else, but you must be present at the meeting to do so. If you drive, you can park in the garage underneath City Hall and get your parking validated in the lobby. If you can’t make it to the meeting tonight, send City Council a letter letting them know you oppose the formation of an appointed board to govern Austin Energy. For more information, please visit www.cleanenergyforaustin.org.